OG Ron Holmes, the forging father of potential Timberwolves first-round pick Shabazz Muhammad, is in trouble again. So what’s the story here? Ron Holmes, father of former UCLA star Shabazz Muhammad, has been indicted on federal bank fraud and conspiracy charges. He is being detained in Las Vegas pending a detention hearing, according to a report in the Las Vegas Review-Journal. Here’s more on Ron Holmes – aka “Ron Shabazz” – including the complete court proceedings (h/t LA Times). 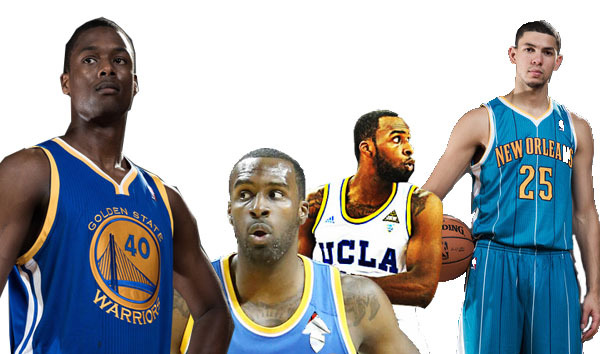 Will Shabazz Muhammad be the next Harrison Barnes, or Austin Rivers? “[Shabazz] Muhammad might be the most controversial prospect in the draft. Blessed with both terrific scoring skills and a tremendous amount of hype, he was widely regarded as a potential No. 1 pick coming into his freshman season. That was Chad Ford’s take in his enlightening post yesterday about Shabazz Muhammad, and the lottery-prospect’s experience at Peak Performance Project. It’s an athletic training facility focused on biomechanical and neuromuscular assessments to help athletes improve on any physical weaknesses that they may have. Apparently the computers are impressed with the Bruin prospect’s leaping ability (he’s a “quick jumper”) but suggest he has work to do in the lateral quickness department. More than anything the article indicates Shabazz is doing all he can to identify and improve his weaknesses. This matters because the Timberwolves might draft Shabazz Muhammad with the ninth pick in the upcoming draft. It’s interesting because a large contingent of Timberwolves fan base (basically, the entire Canis Hoopus commentary community) hates the idea of the team drafting this particular player. How do we feel about Cody Zeller? A brief texting exchange ensued. Since we’re low on Kahntent and it seems apropos to late-May Wolves discussion, I figger’d I’d type it out. Well, the playoffs might have just gotten interesting. If we’re being honest, these playoffs haven’t been too good. There have been some great games, yes. Chicago stunning the Heat in Game 1 without Derrick Rose, Chris Paul going mano a mano with Tony Allen to beat the buzzer in overtime. And of course, Steph Curry. Basically any time he stepped on the court with half-healthy ankles was must-see TV. The Warriors were a blown Game 1 lead away from seriously threatening the now-Western Conference Champion Spurs. But as a whole these playoffs have been a dud. Much is due to unfortunate injuries to key players. Derrick Rose was out all year. Russell Westbrook went down in the first round on a fluke play. Chicago and Oklahoma City — if healthy — are two of the three best teams in the league. Remove them from the equation and things obviously get worse. The Knicks had kind of a special season, but it ended ugly against a stifling Pacers’ defense. Fans calling for Mike Woodson’s job was a bad look. And last night, the “feel good story” of the playoffs — the Memphis Grizzlies — were swept away by the old reliable but never too interesting San Antonio Spurs. But tonight things might’ve changed for the better on the Intrigue Scale. Miami lost Game 4 tonight at Indiana. I didn’t see it coming; not after the beat-down they put on the Pacers in the same arena just a couple nights ago. But a return to their staple — team defense — and some cold shooting by key Heat players paired with some crappy officiating tilted things Indy’s way, and now we have a 0-0, Best of 3 coming up. Shane Battier: Then what’s our goal? What’s our goal? Television, or basketball? Are hard fouls actually a problem? Is RubiOladipo in the Timberwolves future? Trading Up: Should we? Can we? What would it take? Patrick J: Rumor has it that the Timberwolves are looking to move up in the 2013 NBA Draft from their current position at #9. What would this mean in practical terms? Key questions remain, about both the value that could be gotten from moving up, who the right choice would be given the Wolves’ needs, and what Minnesota would have to give up to do it. The consensus is that Nerlens Noel and Ben McLemore are the top two players in the draft. The Wizards would have a difficult time passing on Local Hero Otto Porter at #3. 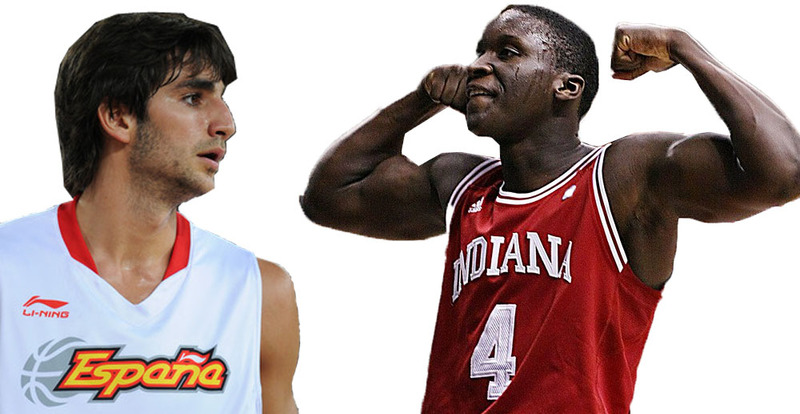 DX currently has Anthony Bennett going #4 to the Bobcats and Victor Oladipo going #5 to the Suns. Wolfson reports that the Charlotte Bobcats — currently slated to pick 4th — would be the Wolves target in a potential trade up. That leads to a series of questions, namely, would the Bobcats give up the #4 to the Wolves, and what would it take? Also, would trading assets for Oladipo be a net positive for the Wolves, given the short-term time horizons of coach Rick Adelman? Would the Bobcats take Derrick Williams and the #9 pick for the #4, which could buy the Wolves Oladipo? The Timberwolves: Are they really the worst? It’s pointless. The Wolves are doomed. Just in the last four years, they’ve decided to take Jonny Flynn, Lazar Hayward, and Wayne Ellington over the likes of Stephen Curry, Paul George, Kenneth Faried, DeMarcus Cousins, Ty Lawson, Jrue Holiday, Brandon Jennings, Klay Thompson, Iman Shumpert, and Larry Sanders. It’s almost too much to bear. Is this true? At least in present-tense terms, are the Woofies really the worst team? What would be the criteria to make such a claim?